The German Express marque was established in 1903 producing Fafnir engined machines in the pioneer period. During the 1930's production switched to lightweight machines employing 74cc and 98cc two stroke singles, a trend that continued when production resumed in 1949. 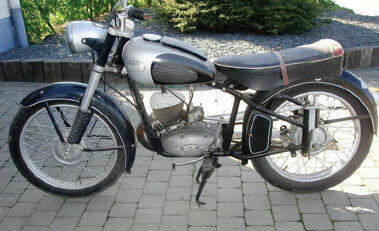 The firm became part of the Zweirad-Union with Victoria and DKW in 1957 although the usage of the name was quickly discontinued. This attractive example dating from 1952 is powered by a 150cc two stroke single built in unit with the gearbox and housed in a plunger equipped frame with telescopic forks.